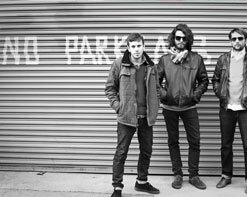 Three and a half years ago we brought you the first video from Sargent House’s new pride and joy, an indie folk trio called Good Old War and their video for “Coney Island”. To say they’ve come a long way since we first saw them inside television screens strapped atop a moving car would be a bit of an understatement. They’ve shown us many sides of their sound with videos like “Weak Man”, “That’s Some Dream”, and “Calling Me Names”, the first single from their newest release Come Back As Rain. But it’s with their newest video for “Amazing Eyes” that they’ve really elevated their presentation and standing in the musical community. The song itself is a gloriously lush ballad that has immediately become a fan favorite, and director Elliott Sellers has responded with a video that not only matches, but exceeds that level of beauty. There is one big reason for that, too, and her name is Peyton List, better known as Jane Sterling from A&E’s hit show Mad Men. When it’s all said and done, these will be 4 of the most rewarding minutes of your day. We hinted that Good Old War has come far as a band and we’ve sure got the proof to back it up. In the first 6 months of 2012 the band has fired off an impressive list of accomplishments such as performing live on Conan on TBS and Hoppus on Music on Fuse, securing opening tour slots for both Counting Crows and Dispatch this summer after their near sold out headlining tour in March/April, iTunes, Amazon, and eMusic features, key national adds for “Amazing Eyes” at AAA radio, earning it such stats as #2 Most Added and #1 Most Increased at BDS and #3 Most Added at FMQB and a slew of positive press from a wide range of outlets like Spin.com, Last.fm, Guitar World, AOL Spinner, and many more. The new video for “Amazing Eyes” begins with the aforementioned Peyton List behind the wheel of an idling automobile, with the rain subtly flying upward towards the sky, almost like a foreshadow of wanting to turn back time and to undo her problems. The members of Good Old War are present in spirit, but simply blend into the background as List and her male counterpart go through the ups and downs of love and romance. Whether it be the heated arguments or the passionate reconciliation, the video moves about the house in a fluid motion through night and day, always capturing the action in the most cinematic way. The theme of the video hinges on one line of the song in particular, with vocalist Keith Goodwin reminding us all that no matter what is said or done in the heat of the moment that he “never meant no harm”. It’s a feeling we can all relate to and a reminder that sometimes it is more important to judge on intentions rather than actions.